Crazy fun with the guys! Grab Your Mates, Shoot Them With Paint! A stag do staple, paintballing is the ultimate stag activity for good reason! What’s better than grabbing your mates, pitting yourselves against one another and going crazy with paint!? 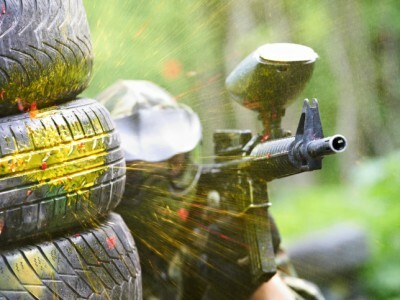 Paintballing on your stag do in Barcelona will have everything that you have come to expect – protective masks, jumpsuits, semiautomatic weapons and paintballs! With this package each member gets 200 free balls. Load up, have fun and get drunk afterwards – perfect!